Pioneers in the industry, we offer shielding tape and copper wire rope from India. Backed by a diligent team and sound infrastructure, we are offering an exemplary Shielding Tape. Complying with the illustrated parameters of the industry, these offered tapes are available to us in different sizes and specifications. Tapes that we offer are highly appreciated for their below-enlisted attributes. 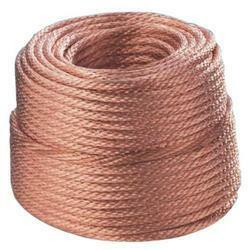 we have engaged om manufacturing, exporting and supplying a wide assortment of Copper Wire Rope.